Bob Olthoff began his racing career in 1957 and became well known in international motor sport circles. In his long and successful career, Bob earned over 140 victories, making him one of the most successful racers in South African history. For more on Bob’s racing career, click here. In 1996, Dennis Olthoff came to the United States from South Africa as the first East Coast dealer for Superformance. Shortly thereafter, his parents, Bob and Johanna “Baby” Olthoff, joined him. As their new business began to grow, they moved into the present location on Mooresville Road in Mount Ulla, North Carolina. The Olthoffs were in the forefront of research and development of the Superformance Cobra. Bob spent three weeks at the Superformance Factory (Hi-Tech) in South Africa testing the Daytona Coupe. 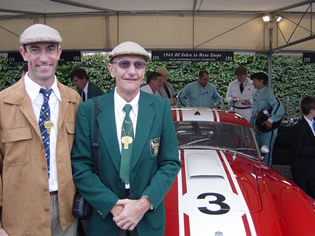 Dennis and Bob completed the first Daytona Coupe in the US in 2001. The Olthoffs developed a loyal following in the Superformance owner ranks with driver training track events, a reputation for quality and technical knowledge. On April 19, 2004, Bob passed away after a brief but fierce fight against cancer. Baby found it hard adjusting to life without her husband, and combined with declining health, passed away two short years later on June 10, 2006. 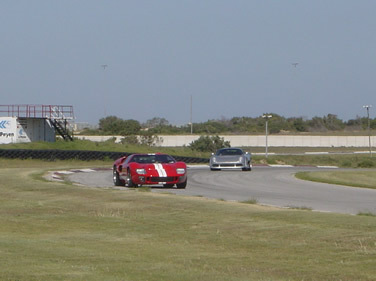 Dennis test driving the first Superformance GT-40 in South Africa, 2005. Dennis has continued the tradition of excellence in product development by travelling back to South Africa in 2005 to test the first GT-40. He has been actively involved with the development of the GT-40 R,(the race version) and continues to make improvements to that car (click here for more on the GT-40). Dennis is the first person called when a difficult question or problem arises, and he is Tech Support for Superformance. Our shop has completed over 500 installations including, 400 Cobra, 45 Daytona Coupe, 70 GT-40 and 7 GT-40R's for vintage racing competition. In an industry where experience counts, we have been actively building, upgrading, maintaining and racing a variety of cars many years.